The precious metal is entering its seasonal sweet spot even as global trade turmoil continues. With stock indexes at or near their highs of the year, a rising-interest-rate environment and ongoing talk and bluster of a global trade war, why hasn't gold taken off? To get some answers, Jim Cramer took a closer look at the charts during the Off the Charts segment of Mad Money Tuesday night with Carley Garner, co-founder of DeCarley Trading and author of "Higher Probability Commodity Trading." Garner believes that precious metals could be ready to make a comeback because the price of gold still hasn't reacted to the current trade war, or the exploding budget deficit, or even the recent uptick in inflation. Cramer and Garner started with a chart of the normal seasonal patterns in the gold market from Moore Research Center, Inc. 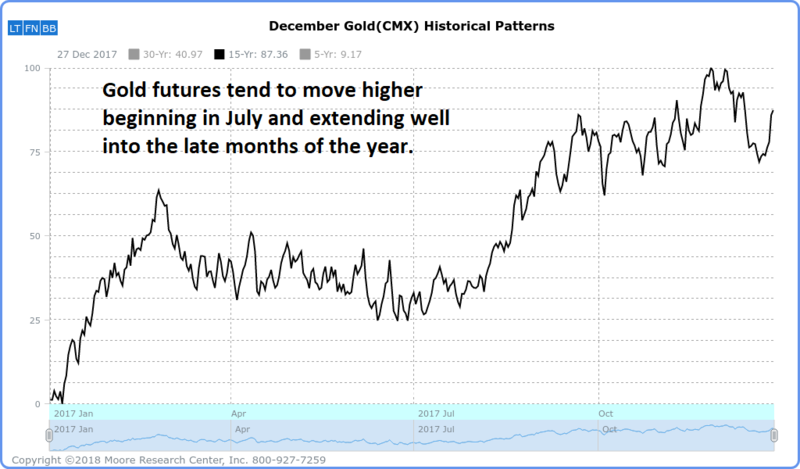 According to their data, going long a December gold futures contract on July 24 and holding it through September 6 has produced a profit in 13 of the past 15 years. And typically, these gains tend to be large. In short, we've just entered the best time of year to bet on gold. While past performance does not guarantee future results, Cramer argued it's better to have these seasonal patterns on your side than to fight against them. From a technical perspective, Wall Street has gotten extremely pessimistic about the precious metal. Garner, a contrarian, likes to go bullish when everybody else is bearish, because that's how you spot major opportunities. According to the Consensus Bullish Sentiment Index, just 28% of the industry insiders that they polled were positive on gold. According to Garner, the rule of thumb when you're looking for a contrarian trade is that you want 25% or less bullish. Gold is very close to that level, which makes her think that sentiment here could be ripe for a shift. Basically, there simply aren't that many people left who can be convinced to abandon the precious metal. Cramer and Garner next looked at a weekly chart of gold futures, which includes the Commodity Futures Trading Commission's Commitments of Traders Report. That data shows exactly how large speculators, small speculators and commercial hedgers are positioned. The group Garner really cares about are the large speculators, the big institutional money managers. While these large speculators haven't yet built up a net short position, they have reduced their gold futures to the lowest levels in years. 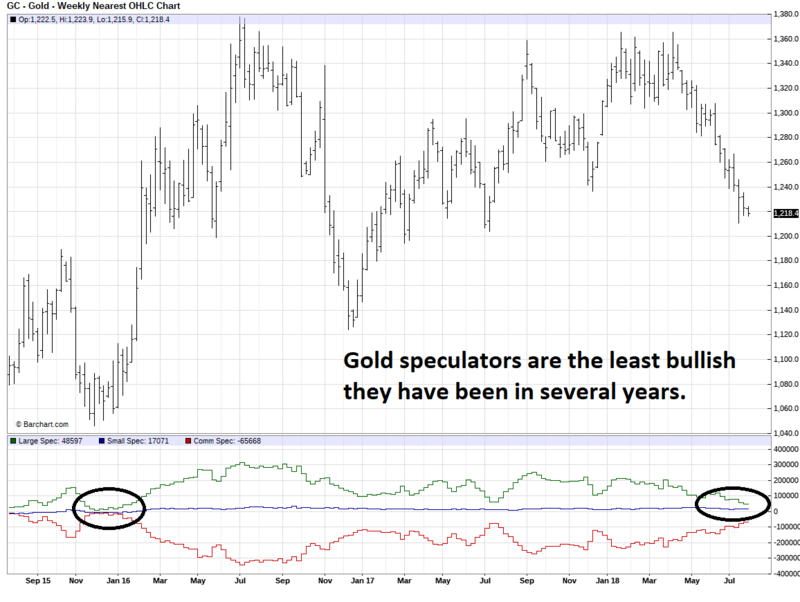 This is a very pessimistic reading because gold speculators are almost always long the market. You rarely see a net short position here. So, when it comes to gold, simply having a very small net long position is a sign that sentiment has gotten incredibly negative. Crucially, the last time the numbers got this low was in December, right before gold rallied strongly. This pervasive negativity is one reason why Garner thinks that a bottom in the precious metal might be imminent. What else makes her feel confident here? Check out the weekly chart. Garner points out that ever since the gold found its floor of support in early 2013, it's been a nightmare for trend traders. On the other hand, it's been a counter-trend trader's dream. Gold rallies have habitually stalled out in the high $1,300s, and you rarely see dips below the floor of support at $1,200. Basically, you rarely see gold make a sustained move in one direction for very long. Sooner or later it changes course and after three months of selling, Garner thinks it could be ready to rally. If the $1,200 level doesn't hold, we might see a downdraft to $1,125, but Garner doesn't expect that to happen. Given that the precious metal usually reverses when it gets too close to its floor or its ceiling, she thinks that the path of least resistance here is higher, with gold heading to $1,350. The daily chart is telling a similar story, according to Garner. There's a confluence of three different technical support levels near the $1,200 level. In addition, the Relative Strength Index, or RSI, an important momentum indicator, is giving an oversold reading. Every other time the RSI has given a similar reading since 2017, gold has rallied. For one more check, Cramer and Garner looked at a weekly chart of silver. While gold is a much deeper market with more volatility, it tends to trade in tandem with silver about 80% of the time. According to Garner, the silver market is seeing significant volatility depression. Silver has been trading in a very tight range for a few years, the exact opposite of how it usually behaves. Basically, silver has been trading sideways and forming a multi-year base. Garner sees this as a sign of underlying strength that leaves the door open for a major rally if sentiment ever starts to get more positive. If silver manages to find a way to break out Garner expects gold will get a boost, too. Cramer and the AAP team say it never hurts to look at the charts of stocks to gain another perspective: Anadarko Petroleum Corp. (APC - Get Report) . Find out what they're telling their investment club members and get in on the conversation with a free trial subscription to Action Alerts PLUS. Over on Real Money, Cramer says there's a strong case to go back and look at retail. Get more of his insights with a free trial subscription to Real Money.